Hello there! I finally got around to posting after a hectic few weeks. I’ve been working on a big project which is all done and dusted now so I will be making more frequent updates between now and Christmas…phew! I sincerely wish there were more hours in the day! I’m hoping to post another Halloween craft in the next day or so. Between now and then here is another macramé bracelet. It’s comprised of a’half knot spiral’ (and is even easier than the square knot bracelet I showed you previously). A few people left comments about the last bracelet saying it looked like it may take too long to make. Rest assured, once you have sussed the knots, you can knock one up in ten minutes! (They are much quicker to make than friendship bracelets). If you don’t like the nuts/washers/wingnuts then just use beads instead. (Speaking of beads…I have a great giveaway coming up later on in the week so stay tuned). By the way thanks to all you lovely people who ‘liked’ my facebook page. You made me feel very welcome! 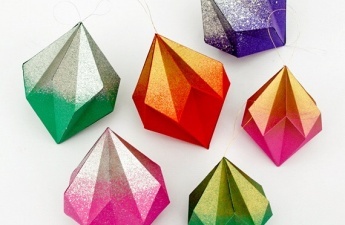 I’ll be posting all my favorite crafts from around the web there so check it out. Please note: I have used different colored cord in the tutorial so that it’s easier for you to figure out whats going on! Cut two lengths of string about a meter in length (You may need more or less, depending on the thickness of your string and the circumference of your wrist. It’s better to cut more than you think you might need). 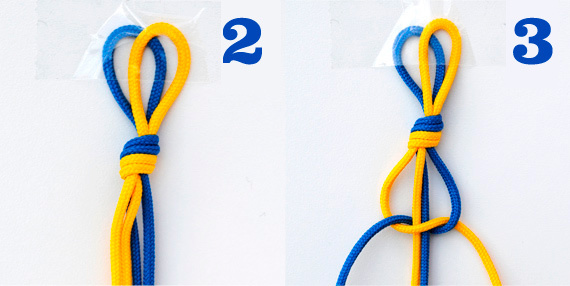 Fold both pieces of string in half and tie a knot just after the fold to form a loop. You should have four lengths of string, hanging down after the knot. Pin or tape the loop to a hard surface (for example a table or piece of polystyrene). Thread on 8 washers (optional). To tie a ‘half knot’ bring the left cord over the two middle cords. Then bring the right cord over the left cord, under the two middle cords and through the loop formed by the left cord. Pull the right and left cord until the knot tightens. Repeat this process and a spiral of knots will form. Keep going until the bracelet is long enough. To finish, add 8 washers and a wingnut, then tie a knot in the end (optional). Note: You fasten this bracelet as you would a friendship bracelet. wow looks amazin’ – just about to try it! Lovely! I will so have to try this out. What kind of cord was used in your tutorial picture (the blue and yellow) and where did you get it? I love the colors. Step 2 – tying a loop: would it not be better use of the cord if you make the side cords longer? I expect the middle cords only have to be the length of the bracelet plus some, whilst the side cords must be long? Hello CraftingInNorway, you are absolutely right. The two central cords don’t get worked so they stay the same length. I think I was just trying to keep the tutorial as simple as possible…. Oh my. This is FANTASTIC. Love, love, love it. Must make one right this very second. Hiya, love all your stuff!! Is it only ever the 2 outside strings that are tied, so always the same 2 all the way down? Yep the two centre cords are always in the centre. You just keep tying the same knot (with the outer cords) over and over. 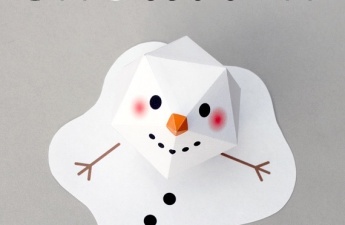 Many years ago I got crazy making these! Best bet sit infront of the TV hook the top loops to a clip board..and prop it between your knees! so easy then! Have to relink you mon. 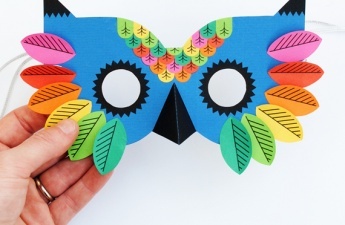 what a great craft for all ages to make. Thank you so much for the easy tutorial. This is brilliant! Next time I’m at the store I’ll pick up some bright shoelaces and give it a try. Thanks for the easy tutorial. This bracelet is a great idea. I used to make hemp bracelet similar to this years ago. They really are simple to make. My favorite part about this one is that men would love them as well. The edgy look mixed with anything coming from the garage is perfect for any man! 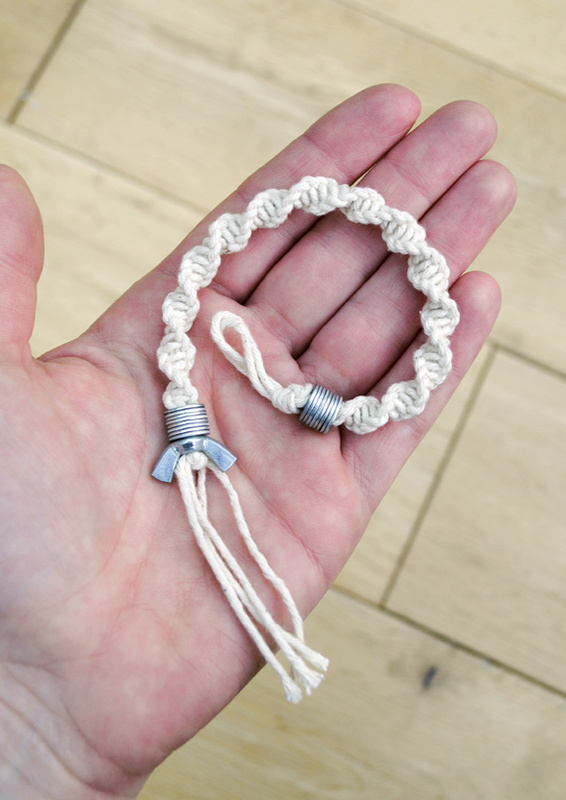 What kind of cord did you use in the completed picture of this bracelet at the top of the page? Hi….it’s regular string which you can buy from supermarkets or garden centres! Can you post a pic of the bracelet when it’s fastened? I can’t figure out, from the pic, where the loop goes. hi, don’t know how to fasten bracelet, never made friendship bracelet b4. how to do? 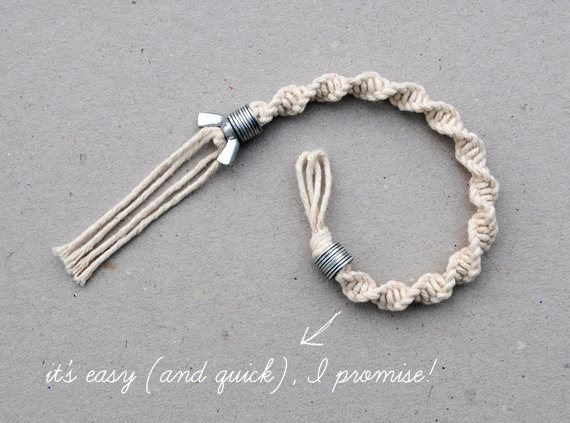 Hi, you can find my macrame bracelet from my blog. I used your tutorial (and also linked it to my blog) but I added some hama-beads on these. I found it very useful to mark those strings with colourful hama-beads, and on the middle I had needle for those hama-beads. That worked fine. You can also find my first 3D paper diamond from the same post. You are welcome to use those hints and photos if you like. Photos are took by my phone so quality is not super. I’ve been looking for one to successfully wrap my headphones, and the other tutorials don’t give the best descriptions on how to tie the knot. I will try and investigate the headphone wrapping one…. mine did’t turn out with a spiral am i doing something wrong? Can you email me a picture (katepetty@gmail.com)? I was looking for crafts for an altered poetry book I am working on and saw this. It worked and looks perfectly. I used it for a handle. just on question. how to i tie the first knot? I just can’t figure it out. Hey Kate! Awesome tutorial 😀 I am making one for my best friend and I was wondering if its ok if I use wool instead of packing string? You could do it with wool but wonder whether wool would be a bit skinny. It would be better if you could do it with some thick beading cord or something like that. Let me know how you get on. HI! Where did you get those washers/wingnuts?!? Hi, love this tutorial. I can’t seem to get the knots to have the definition that yours does. I’m using plain packing string. Is there anything that I can do to them to get the knots to tie tighter and the pattern to be more defined? Do or would you sell these? Different colors, variety? What would you charge by the dozen? Thanks 4 help. God bless you. I have just try this really awesome, I really enjoy this. Thanks for sharing. Thanks for sharing this helping post. Really appreciate. I forgot to say thank you for posting this!it`s amazing…….